Welcome to the Rochester Institute of Technology chapter of the American Association of University Professors. Our goal is to provide the RIT academy an organized voice through which to discuss concerns and communicate issues. An honest effort is made to serve the interests of all without hostility toward any. We provide here a guide to University Resources for Discussing and/or Reporting Concerns about Unethical Conduct, Harassment, or Discrimination, created by a committee of RIT faculty, staff, and legal counsel in 2009. Meetings are scheduled monthly on Wednesdays from 10-10:50 AM, as announced by email. The New York State Conference of the AAUP will hold its semi-annual meeting and conference on April 5th and 6th, 2019 in Rochester, NY at Monroe Community College, main campus, at 1000 E Henrietta Road, Rochester, NY 14623. In addition to the regular business meeting on Friday from Noon to 5:30 PM, a conference on Saturday from 9 AM to 3 PM will feature guest speakers on subjects of interest to members of AAUP and other faculty organizations. We asked for your input and availability in order to maximize this opportunity. One hundred and thirty-six (136) of you took the time to answer our anonymous RIT clipboard survey that closed 2/20/15 to maximize the value of this meeting. Thank you for your considered and respectful input. The meeting took place and was well attended. The results of the survey and the minutes from the meeting are linked below. The 2013-2014 Instructional Activity Report [PDF] has been released from the Provost's office. · Compares instructional activity over the past four years so that the university can see trends over time. Megan Fulwiler and Jennifer Marlow from the College of St. Rose, Albany have just released a documentary about adjuncts who teach basic writing courses although the issues apply to all adjunct faculty. RIT Faculty Statistics have been updated and now includes composite RIT faculty statistics from 2006-2012. The Information Security Office has added a comment period for proposed standards. The comment period for the standards below runs from September 3, 2012 to October 2, 2012. The effective date for most of the proposed standards is January 1, 2013. The Academic and Business Continuity and Disaster Recovery Standard would be effective on January 1, 2014. Please join the standards governance process by reviewing the standards. If you have comments, please send them in an email to infosec@rit.edu. The NYS AAUP Conference Fall 2012 will be held will be held at Rochester Institute of Technology, Rochester, NY October 19-20th, 2012. President Emeritus Albert Simone will be our open forum keynote speaker on Friday 5:00 PM - 6:30 PM, October 19th. We are currently collecting topics for discussion in our open forum. Please SUBMIT recommendations for conference open forum topics. 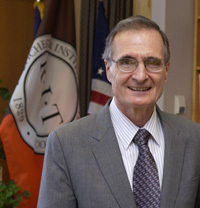 Information: Dr. Albert J. Simone was president of Rochester Institute of Technology from September, 1992 through June, 2007. He is the eighth president in the university's 178-year history. He was formerly president of the University of Hawaii System and chancellor of the University of Hawaii at Manoa for nine years. He is a member of Phi Beta Kappa, Beta Gamma Sigma and Phi Kappa Phi, he is the author of several books and numerous journal publications on the application of mathematics, statistics and computers to economics and business. Just a few of Dr. Simone's professional accomplishmnets include; Past Chairperson of the Board of Trustees of the New York Commission on Independent Colleges and Universities; Federal Reserve Bank of New York; HSBC Bank USA Advisory Board; State Higher Education Executive Officers; Advisory Council on International Services; Advisory Group on International Arbitration; National Collegiate Athletics Association Division 1 Presidents Commission. A report just out from the AAUP (http://www.aaup.org/AAUP/newsroom/2012webhighlight/congovreport.htm) examines these issues and makes recommendations for the inclusion of faculty holding contingent appointments in campus governance structures. •	Faculty members who hold contingent appointments should be afforded responsibilities and opportunities in governance similar to those of their tenured and tenure-track colleagues. •	Institutional policies should define as “faculty” and include in governance bodies at all levels individuals whose appointments consist primarily of teaching or research activities conducted at a professional level.
? Eligibility for voting and holding office should be the same for all faculty regardless of full- or part-time status.
? All members of the faculty should be eligible to vote in all elections for college and university governance bodies on the basis of one person, one vote. •	While faculty in contingent appointments may be restricted from participating in the evaluation of tenured and tenure-track faculty, they should have the opportunity to contribute to the evaluation of contingent faculty. •	All faculty members should, in the conduct of governance activities, be explicitly protected by institutional policies from retaliation. •	Faculty holding contingent appointments should be compensated in a way that takes into consideration the full range of their appointment responsibilities, which should include service. While the revised B 2.0 Charter of Academic Governance [DRAFT] passed in Academic Senate by a healty 2/3 majority it failed to achieve the required 2/3 support from RIT Faculty. Of the 796 faculty eligible to vote 117 cast a vote. The results were 67 in favor of the changes and 50 opposed. The current version of B2 requires that changes be approved by two thirds of those voting. Therefore the proposed changes are not approved and the current version of B2 remains in effect. One of the charges to the Faculty Affairs Committee this year will be continue their work on developing a new version of B2. Attached are the minutes and talking points from the Non-tenure track faculty meetings held 1/21 and several follow up meetings. Faculty Development. Presently, there is no consistent policy about whether or not contingent faculty qualify for funds that would allow them to travel to conferences and/or conduct research that would allow them to grow as teaching members of the RIT community. Balanced distribution of faculty ranks. Discuss the Provost’s idea of a balanced, Institute-wide distribution between tenured and tenure-track, lecturer and adjunct faculty. Fair compensation. As of now there is no direct connection between lecturer ranks and salary. There is no provision for adjunct faculty to receive increases on the same basis as other faculty and staff. This has resulted over the years in adjunct pay falling far behind inflation. In addition, there are significant discrepancies in contingent faculty pay practices among the colleges. All contingent faculty are welcome and encouraged to attend. We need to be active in the decision making of the Institute. To meet and discuss is a good beginning. Bringing our concerns to the administration is the next step. RIT AAUP invites all RIT faculty to join us Friday September 17th, 4-6PM for our monthly meeting and follow up social at MacGregor's, 300 Jefferson Rd, Rochester. We want to extend a special invite to Adjunct Faculty. New Faculty Majority (NFM) national campaign will help eligible adjunct college and university faculty obtain unemployment compensation in between academic terms. Many instructors don't check to see whether they are eligible. Others are denied on grounds of having reasonable assurance of re-employment, a phrase in federal law whose invocation by postsecondary employers has been challenged, most successfully in California and Washington, by arguing that employment which depends on variables like enrollment, funding, and administrative prerogative cannot constitute reasonable assurance. The new reorganization that combined Teaching and Learning and Wallace Library in now called the Wallace Center and is under the direction of the dynamic Lynn Wild.The college based faculty contacts are a great resource for all faculty. We especially encourage all part time faculty to make use of this faculty resource help with course materials, orientation to resources available for teaching. The wallace center is actively organizing Adjunct orientations and Learning Communities. On November 19, 2009 Academic Senate approved a protocol for the consideration of our future calendar at RIT. The protocol includes four motions to be used to determine the recommendation of Academic Senate to President Destler. A survey has been created in multiple versions to collect feedback from RIT faculty by college and by whether you are tenure track (tenured or not yet tenured) or non tenure track faculty. The results of the survey will be made available as additional feedback to the respective college Academic Senators to help inform their vote on motions 2-4 that will take place on January 14, 2010. Please review the documents available to you (http://www.rit.edu/academicaffairs/priorities_initiatives.php) before taking the survey. Note that this is only one way for you to participate in the Calendar decision being made. We urge you to contact your Academic Senators directly for additional opportunities to be involved. Included below is an SG Fortune Cookie prediction on the outcome. What do you thnink? RIT AAUP invites all RIT faculty to join us Friday September 18th, 4-6PM for a social at MacGregor's, 300 Jefferson Rd, Rochester. We want to extend a special invite to Adjunct Faculty. Please note that we will be holding our regularly secheduled monthly meeting at MacGregors beginning at 3PM and as always all are welcome to join us at 3PM and stay through the ensuing social. RIT AAUP is sponsoring a social Friday 11/7/08 from 4-6PM at MacGregor's on Jefferson Ave near campus. As usual, appetizers, broadly defined, will be provided. This will be a good opportunity to meet like minded colleagues and discuss ways that RIT AAUP can serve you better. ALL INSTITUTE FACULTY are welcome so please join us. We are pleased to announce that Provost Haefner will attend our next RIT AAUP meeting. We look forward to discussing ways that RIT AAUP can be of service to the new Provost. A Summary of RIT AAUP Concerns for 2008-09 will be shared. Add your comments about these survey results to the Adjunct Faculty forum discussion. A Statement on Expectations for Tenure and Promotion DRAFT [PDF] has been presented by President Destler and will be discussed at the Academic Senate meeting on May 1st. Please review and forward comments to your senator or add your comments to the forum discussion on this topic. Thank you. A proposed revision to the Lecturer Policy E6:4A was approved at the Academic Senate meeting on May 1st. Add your comments on this change to the forum discussion on this topic. Thank you. RIT has hired Dr. Jeremy Haefner as our new Provost! Dr. Jeremy Haefner is our first and only choice of the candidates presented for provost." L Paul Rosenberg, is the Chair of the newly formed Provost Search Committee. The Provost Search Committee is welcoming recommendations and suggestions from the RIT Community. Up-to-date information on this process is available at Search for the RIT Provost. A RIT New Provost Search topic has been added to the forum. Contingent Faculty Discussion Points v6 is a document that will be covered at the RIT Academic Senate meeting 1/10/08 1:05-1:50 PM in SAU 1829 regarding Contingent/Adjunct (non-tenure track) faculty at RIT. IF you can't make the meeting add to the Adjunct Faculty forum discussion. Did you know: ~42% of RIT faculty are non-tenure track and for fall quarter 2007 this group provided 46% of credit hours earned. RIT AAUP invites all Contingent Faculty and Tenure Track Faculty as well, to join us for a Contingent Faculty Organization Meeting and showing of the film: Degrees of Shame - Part-Time Faculty: Migrant Workers of the Information Economy by Barbara Wolf Nov 2nd 12-1 PM in SAU CLARK B. Meanwhile join our Contingent Faculty discussion on the forum. RIT AAUP is making a concerted effort to reach out to the contingent faculty at RIT. A dialogue continues in our forum and includes a recent salary survey conducted by Provost McKenzie. Various activities will be announced. Campus Equity Week highlights the exploitation of contingent Faculty and is October 29 - November 4, 2007. The purpose of the week is to bring attention to the poor working conditions of many contingent faculty members and to the threats to higher education posed by an increasing reliance on part- and full-time non-tenure-track appointments. Additional information and resources are available on the AAUP site. AAUP's Committee A on Academic Freedom and Tenure has released a new report, Freedom in the Classroom (2007) to assess arguments made in support of recent legislative efforts to regulate classroom instruction. The 1940 Statement of Principles on Academic Freedom and Tenure affirms that "teachers are entitled to freedom in the classroom in discussing their subject." This affirmation was meant to codify understandings of academic freedom commonly accepted in 1940. In recent years these understandings have become controversial. Private groups have sought to regulate classroom instruction, advocating the adoption of statutes that would prohibit teachers from challenging deeply held student beliefs or that would require professors to maintain "diversity" or "balance" in their teaching. This report is a response to these efforts. The Academic Senate Standing Committee Charges for 2007-08 were approved at the September 20th meeting. William W. Destler announced as Rochester Institute of Technology’s ninth president. 175 faculty out of 999 full-time faculty respond to the Academic Senate Survey conducted on this site and included over 64 pages of comments. The results are shared with the RIT Community, the RIT Presidential Search Committee and the RIT Board of Trustees. Retirement Eligibility Policy Change is approved at Academic Senate. After additional meetings with Judy DeCoursey and Patty Spinelli of RIT Human Resources and careful review with two lawyers having the faculty/staff perspective, we are in agreement with wording for Retirement Benefits Policy Change. The policy will be brought back to Academic Senate for a third time to get a vote of support. Read the proposed revisions and comment in the forum. RIT has 321 Adjunct out of 1299. Read the article "Equal Rights Legislation for Adjunct Professors," by Keith Hoeller (Adjunct Advocate) and comment in our forum discussion on the article or your perspective/experience with the use of Adjunct Faculty at RIT. All RIT Faculty are encouraged to review the General Education White Paper DRAFT proposal. Comments and suggestions would be appreciated by12/4/06 to allow time for the drafting committee to orgainze their presentation to for discussion at Academic Senate on 12/14/06. Forum discussion established for the RIT community to discuss both the short term and long term issues and recommendations related to campus parking. 79 Faculty responded to the question of whether any changes in physical resources are required to support scholarly activities emphasized in the recent Strategic Plan. ISSUE 2005-001 Faculty Ombuds Office -APPROVED!!! Update - President Simone presents the plan for a faculty/staff/administrator/student Ombud's Office effective August 1, 2006 to the Board of Trustees. The current half-time Student Ombud's Person is now full time and is filling the Ombud's Person position for the first year transition period. Update: President Simone calls for an Internal RIT Climate Study at the July Board of Trustees Meeting. A new Website is dedicated to RIT’s search for its 9th president: www.rit.edu/presidentialsearch. President Simone is retiring in mid-2007. The Website will highlight the search process and provide news and updates until the Board of Trustees selects a new president. The site also features a feedback area. Update - The Faculty Affairs standing committee of the RIT Academic Senate is being charged to review workloads among the colleges of RIT and recommend a campus-wide guideline to be included in the Institute Policy & Procedures Manual. Update - The Academic Affairs standing committee of the RIT Academic Senate is being charged to review the non-degree course and activites requirements of all students at RIT. This revision adds the major new category of Research Faculty at RIT. Faculty should appreciate the opportunities available to move between their Tenure Track position and a Research Faculty position.